To make breadcrumbs, cut the crusts off the bread, then cut the slices into quarters, and blitz them into fine breadcrumbs in a food processor. Mix a sprinkling of finely grated parmesan into the breadcrumbs. Put the turkey into a shallow dish and spread both sides of the meat with the sundried tomato paste. Put the breadcrumbs in another shallow dish, and one at a time, dip the turkey into the breadcrumbs to coat each side. Place the turkey escalopes on a baking sheet and cook in the oven pre-heated to 160°C (fan) or 180°C (conventional). They will be ready in around 10 minutes. Turn half way through cooking, and just check they are cooked all the way through by piercing the middle with a knife and making sure there is no pink meat and that the juices run clear. Carbs: 9g carbs per escalope. Note on adapting quantities: I’ve based this on coating five escalopes with the breadcrumbs from three slices of bread (45g carbs). If you are making larger quantities, just tot up the amount of carbs in the bread – usually 15g per slice – and divide by the number of escalopes, chicken or fish strips you are making. Simply halve the potatoes and cut the carrots into wedges, and place on a baking tray. Drizzle with rapeseed oil and season with sea salt and black pepper. Roast in the oven pre-heated to 160°C (fan) or 180°C (conventional) for around 25-30 minutes, turning occasionally, until golden and crispy. 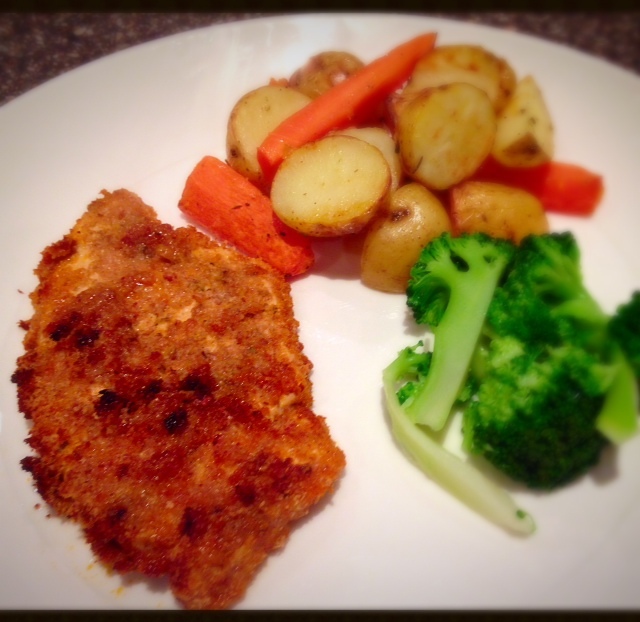 Will add this to the list – schnitzels and boys- always a winning combo! Thanks!